As one of the largest commercial property management and development firms operating in Virginia and West Virginia, Shockey Realty Company can quickly help find the location that’s right for you. Shockey’s business model is focused on long-term ownership. We provide regular property management team visits to every site location, so that our tenants are always operating in a well-maintained and safe environment. Our commercial and industrial property inventory includes millions of square feet of CRE space in four primary geographic markets – Fredericksburg, VA; Winchester, VA; and Martinsburg, WV, and Charles Town, WV. Our tenants are our top priority. We believe in open dialog, quick responses, and personal service. 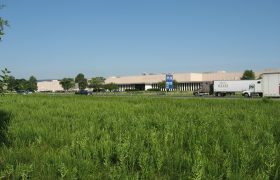 Typical tenants include industrial, manufacturing, warehouse, distribution center, office, and retail. Our portfolio of properties offers four million of square feet under management, and we also have land holdings of 522 acres, many with build-to-suit options. In addition to the adaptive reuse of former manufacturing facilities, we have developed ten new buildings. We are currently developing property along the I-81 corridor and the I-95 corridor. For fast and personalized service, please contact Wade Johnson at 304-263-7129 to search for site locations, available property for lease, or to discuss a new real estate project.